Below is our current prediction of state results if the election occurred today (as of November 5th, 2016). This is based on a variety of state polls, early voting indicators, and strategic campaign movements. The race has changed from a toss-up, to one in which Trump is projected to carry enough electoral votes to win (four recent polls have showed Trump tied or leading in New Hampshire, and early voting now favors Trump in Colorado, giving him a slim hold on the necessary 270 EVs). 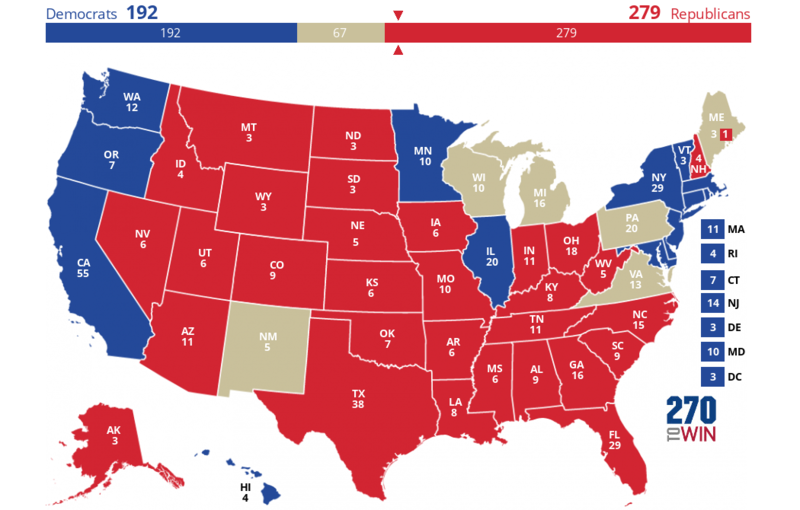 If Trump holds all of the projected red states below he will win the election with 9 EVs to spare. Clinton will need to sweep every toss-up state and flip any two close red states to win - New Hampshire, Colorado, and Nevada being the most likely red states she might flip.